There is a natural occurrence to be met with upon the highest part of our down in hot summer days, which always amuses me much, without giving me any satisfaction with respect to the cause of it; and that is a loud audible humming of bees in the air, though not one insect is to be seen. This sound is to be heard distinctly the whole common through, from the Moneydells, to Mr White’s avenue-gate. Any person would suppose that a large swarm of bees was in motion, & playing about over his head. This noise was heard last week on June 28th. Beowulf Cooper says he found it in 1973, but didn’t give a precise location. Phil, a blogger, went in search of it in 2012, but didn’t succeed in locating it. Yesterday, I went in search of the Selborne DCA and met with success, though not quite as dramatic as Gilbert White’s experience. 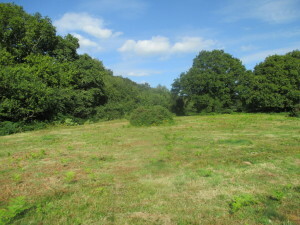 Selborne Common is on a 200 metre high Greensand plateau on the edge of chalk country. The best way to reach it is up the beautifully conserved Zig-Zag path first created by Gilbert White and his brother in 1753. Selborne Common with the Zig-Zag Path on the far right. 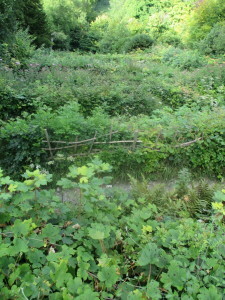 Looking down the 75 metre high Zig-Zag Path. Selborne Common today is quite heavily wooded with many beech trees and some small clearings. In White’s day it is likely to have been less wooded and more open mainly because of the many sheep that grazed there. Armed with my extra-long fishing rod and queen lure, it wasn’t going to be possible to get above the trees to test for the DCA, so I headed for the various clearings in the woodland. 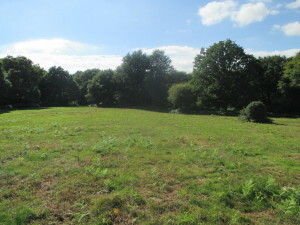 The clearings are mostly quite small except for one of about two or three hectares on Sheep Down – and that is almost the highest point of the Common where White says he heard the buzzing. The clearings on the side showed up nothing, but in a small clearing just before Sheep Down two drones were attracted to the lure. On Sheep Down the presence of drones was unmistakable with the lure. In fact I was hit on the head a few times by wayward drones, an indignity which I don’t think White suffered. The Selborne DCA has significant differences to the others I have discovered especially because it is enclosed by trees. But altitude and exposure to the breeze fitted the pattern. 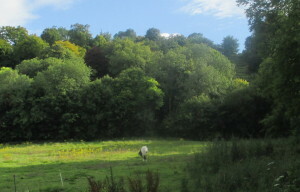 Looking east in Sheep Down clearing on Selborne Common. Looking west in Sheep Down clearing on Selborne Common. Yesterday, the number of drones attracted to the lure was quite small (not nearly as many as in the image below), but then August is late in the honeybee season and many drones have now been expelled from colonies that are ‘queen-right’ and beginning to prepare for winter after the end of the summer honey flow. Finally, here is the sound from late yesterday afternoon. What Gilbert White heard in the 18th century was obviously much louder. Perhaps there were more bees back then and no twentieth century intrusive noises. Also, he dates his experience to the end of June when there is likely to be much more drone activity. Next June is already marked in my diary.